The end of term party is a routine activity conducted at Sekolah Gunung Merapi to mark the end of another term. This event is usually attended by parents and students of Sekolah Gunung Merapi. This event is a long-awaited event by all of students Sekolah Gunung Merapi because it usually features various performances. Moreover, organizers of Sekolah Gunung Merapi will also distribute certificates and report cards concerning students progress and also to distribute awards for student achievements in non-academic fields. The end of term party was held on December 21st 2018 and conducted inside the school since the weather conditions were unpredictable. In this event, all of students show various performances such as singing, musical drama, dancing, and poetry reading. 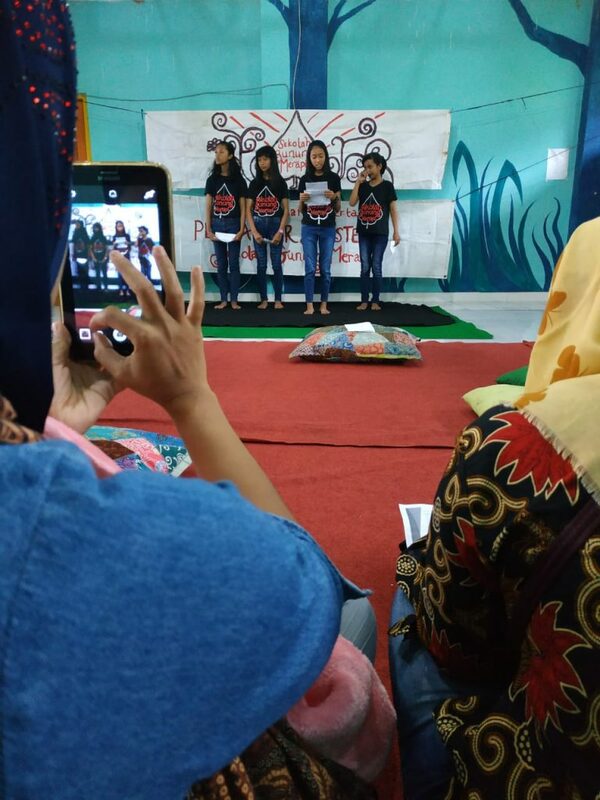 As an opening of the event, the students of Sekolah Gunung Merapi sang together the song Generasi Tangguh. Generasi Tangguh which means “The Resilient Generation” is a song about mitigation of volcanic disasters and was especially created for children with the aim to increase childrens understanding of volcanoes in Indonesia and what actions to take when there is any increase in volcanic activity of Mount Merapi. Pembacaan Puisi: karya anak-anak dari kelas Bahasa Inggris level 3. One of performances that has long been trained and involves almost all of students was a musical drama. Students of Sekolah Gunung Merapi played various traditional games while singing traditional songs such as cublak-cublak suweng, oglak-aglik, lepetan and padang bulan that interspersed by themed drama about folklore with the title “Buto Nyaplok Bulan” which means “The giant that are the moon”. This musical drama was a great success and went smoothly, marked by laughing throughout the audiences when the event went on. 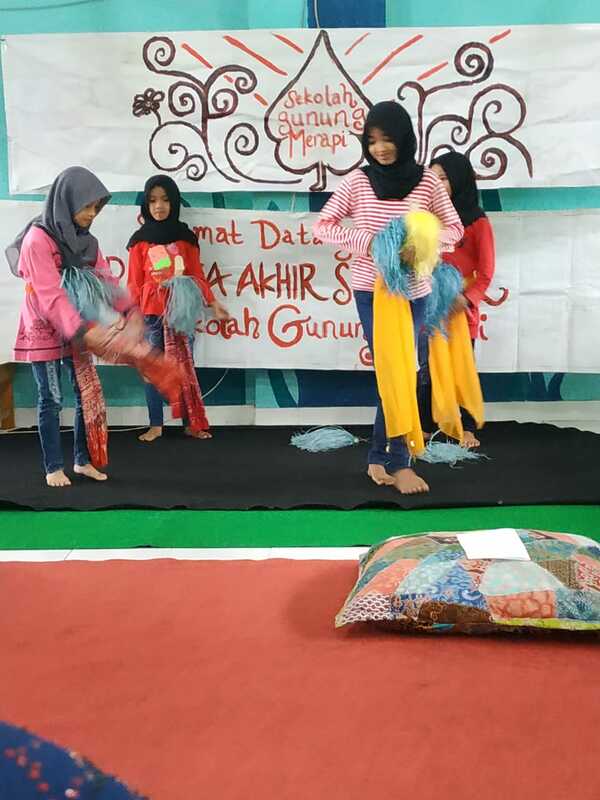 The other performances was dance performance with the title “Kebyok Anting-Anting”. That performance presented by five of students Sekolah Gunung Merapi. They trained independently without assistance from volunteers. Some other students reading poetry with the title “Guruku (My teacher”) dan “Gunung Merapi (Mount Merapi)” their own masterpiece. 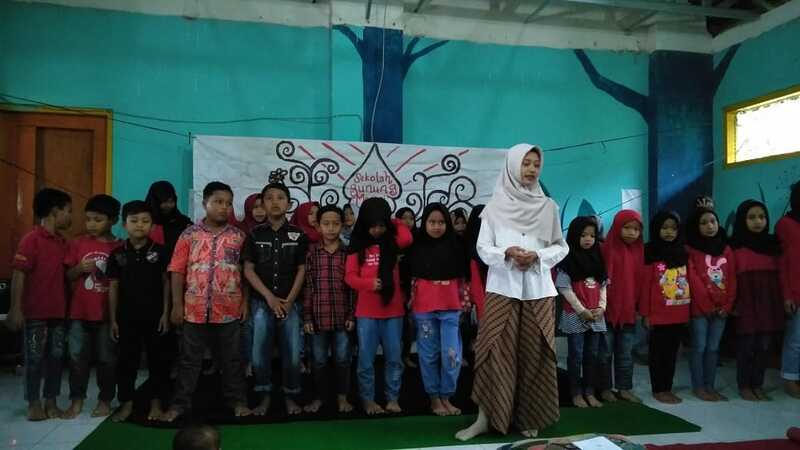 There were sing performance that presented by three students with the title “Maulana ya Maulana” as well. Para pemain di drama musikal “Buto Nyaplok Bulan” bersama dengan gurunya Annisa Nur Aini. After all of students show various performances, the next session is certificates distribution. 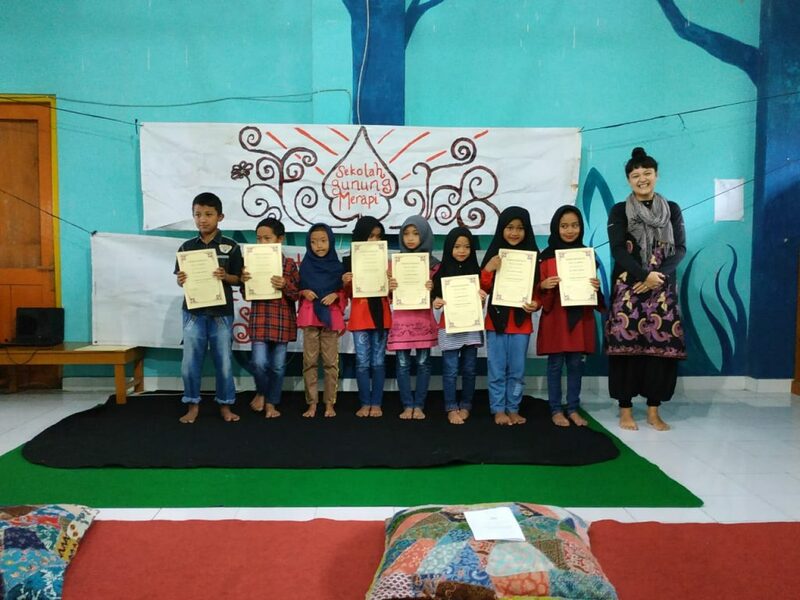 Certificates shared by Miss Yasmin as coordinator and teacher at Sekolah Gunung Merapi. Certificates distribution conducted by call students name appropriate with their level then students asked to come forward to the stage. The next session is award distribution in the form of present and certificate to outstanding students. The awards give to students who are most diligent in reading books as extraordinary reader, the most diligent students come tutoring, and the most creative students. Anak-anak menerima sertifikat penyelesaian kursus dan hadiah prestasi. 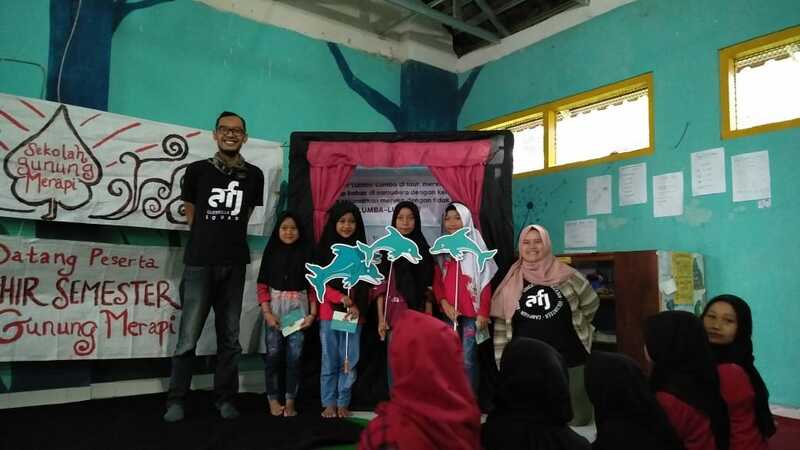 The closing event on the end of term party was conducted by Animal Friends Jogja (AFJ) community. 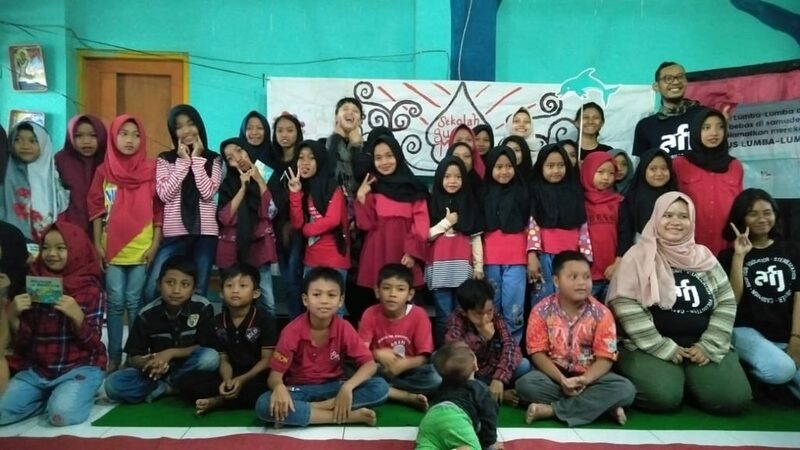 Animal Friends Jogja (AFJ) is a community of animal lovers from Yogyakarta City and has collaborated with Sekolah Gunung Merapi. In this opportunity, AFJ shows drama with the title “Lulu Si Lumba-Lumba” (LuLu the Dolphin). In this drama is told about many dolphins are caught by human and used as circus players, one of dolphins that caught named “Lulu”. When dolphins are trained to show various attractions, the trainers are usually do not give some food to dolphins until they obey instructions from the trainers. The dolphins are very tormented, where they live apart from their groups and live in the narrow pool. This drama gives messages to students in order to we always love animals by not doing hunting and employed animals. Anak-anak dengan penuh perhatian menonton drama boneka “Lulu si Lumba-lumba” karya untuk meningkatkan kesadaran kesejahteraan hewan oleh Animal Friends Jogja (AFJ). Para pemain “Lulu si Lumba-Lumba” berpose bersama dengan anak-anak SGM. After finishing the puppet show, all of students and parents were welcome to eat dishes prepared as a sign that the end of term party was finished. The end of term party has run success and smoothly. Hopefully in the future the end of term party will be held again with an ever increasing variety of creative, innovative, and constructive performances. Thanks so much and enormous congratulations once again for all our studets hard work and for all the students, parents and volunteers who helped make this end of term party really special! 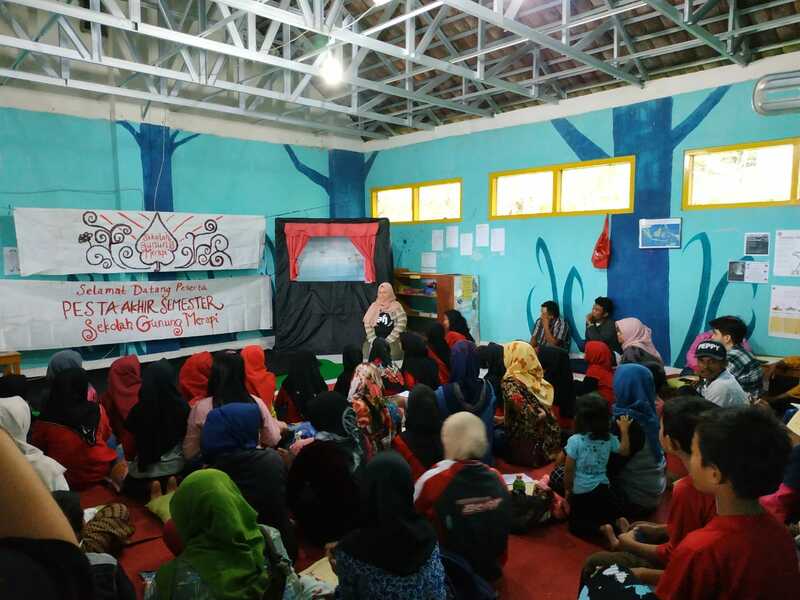 This article was written by Annisa Nur Aini and translated into English by Arie Brianita, SGM interns since July 2018. Foto bersama semua peserta Pesta Akhir Semester SGM, December 2018.